Yep, it happened to me once...the problem has nothing to do with GV. It's just that when it's loading...it takes a long time to go to menu screen. You need to close all your programs and try not to open lots of things once you are logging in. Also you know how there is a loading bar on the top. First let that finish and then log in. And most importantly make sure to run GV before you actually start playing. That's why I use downloaded version to play. It's better if you actually use downloaded version to play SFO. If none of these things work, then just clean your cache..restart your computer and try running SFO again . Try cleaning your pc by disfragmenting and a disk clean up. That glitch happens to me too. As a result I also have to restart my game. I think this only happens when I have my vindicator activated, but every time when akuma uses the tenma gouzankou he happens to follow me with it when I perform my super jump to avoid it right before he performs it. I happen to get stuck by it and I lose. Another move of his that happens to be following me is his messatsu gou shoryu. I sometimes think to myself on how does he do that? I thought this would be the place to report this kind of bug because I really think this happens only when I use the vindicator. Quote[/b] (CFRatao @ July 17 2007,07:39)]That glitch happens to me too. As a result I also have to restart my game. I think this only happens when I have my vindicator activated, but every time when akuma uses the tenma gouzankou he happens to follow me with it when I perform my super jump to avoid it right before he performs it. I happen to get stuck by it and I lose. Another move of his that happens to be following me is his messatsu gou shoryu. I sometimes think to myself on how does he do that? is Game vindicator malicious and that TMyApp and the other Moderation squad can read our stuff thats basedm on my PC?? alright I made a quick Vid on that video that people are complaining about. Basically yea it shows on how Akuma's Tenma Gou Zenkuu keeps following the position of the opponent player as he/she Jumps up. Quote[/b] (ryuishero @ July 18 2007,15:10)]alright I made a quick Vid on that video that people are complaining about. Basically yea it shows on how Akuma's Tenma Gou Zenkuu keeps following the position of the opponent player as he/she Jumps up. Thanks for showing that vid because it happens to me in every game. It's weird that Ryu's super does not follow anyone like that. Akuma has the most glitches in the game and I have recently decided to ban Akuma with all of my matches. All of his moves tend to follow anyone no matter what spot they are at. The worst that can happen to anyone is to lose by glitches. 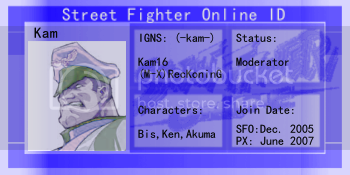 Most of my losses came from Akuma because of these glitches. Messatsu Gou Shoryu, Temna Gou Zankuu, and even some of his regular special moves follow anyone as well. It's a bit annoying however I still enjoy playing this game even if it means to ban one character from my hosting games. Don't forget that the Vindicator allows you to enable new visual effects in SFO (these include: motion blur, bright flares, as well as new character animations and features). It is possible that your computer may not be powerful enough to handle these new effects, and as a result, even though GV offers no slowdown to your system, SFO may become "slow" or "unplayable" when using (or playing against) Vindicated characters like Ryu and Akuma. The solution would be to turn off all of the game's new graphics and effects. This can be done by un-checking the "Induce Seizures" box in the "Options" section of SFO's main menu (under the tab called "Other"). Alright too many post and It very difficult to read them all. I uninstalled Shockwave 8 and downloaded the recent shockwave. It seems that Download version doesn’t support it or something and it through me out a warning tab. When I installed Shockwave 8, I’m not allowed playing online. 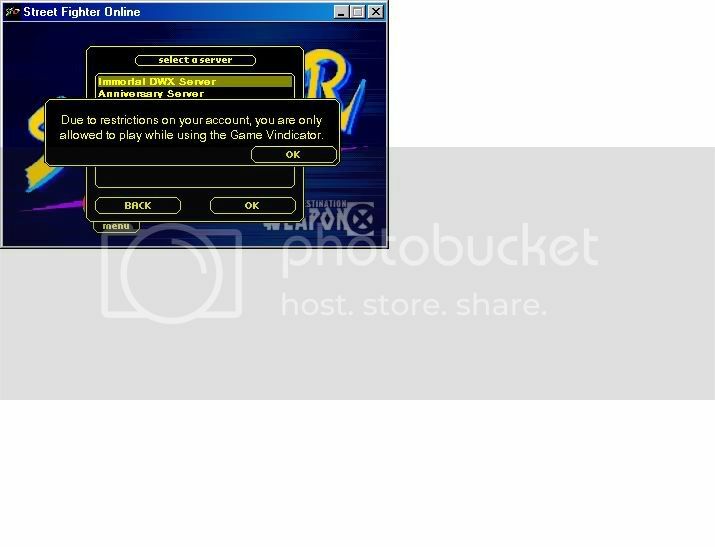 Quote[/b] (MEGA_DRACOS_XRL @ July 18 2007,14:43)]is Game vindicator malicious and that TMyApp and the other Moderation squad can read our stuff thats basedm on my PC?? This is my warning to you..
MEGA_DRACOS_XRL :No it's not malicious,as far as i can work out i think it just detects any speed enhancing programs your running in the background whilst the vindicator and sfo are running. What you got to bare in mind is that simply going on the internet means your computer and other computer/servers are sharing files and data all the time-nothing new or specail about it. By downlaoding the vindicator your agreeing that it is allowed to scan for these speend enhancing programs that interfere with SFO's application,changing certaininformation that your sending and recieving. What makes the Game Vindicator stand out? Unlike other anti-cheat software, Game Vindicator has a proprietary cheat detection system, which uses 4 different ways of detecting outlawed software, hacks and viruses which may be present on the end-user's system. Also, Game vindicator is the only program on the market which supports Browser-Based games (such as those created in Flash, Shockwave and Java). But on top of providing one of the most sophisticated game protection systems out there, Game Vindicator takes your privacy into consideration. With the Game Vindicator, none of your personal files or data are ever collected, stored or analyzed. No information is ever saved about you or your computer, and no information is ever sent back to the Game Vindicator server. And of course, Game Vindicator is 100% free from Spyware, Viruses, Trojans, Malware, Worms, Adware and Ads. In short, there is absolutely no risk to you or your computer, when it comes using the Game Vindicator. Another welcome feature, is the fact that t he use of Game Vindicator is strictly voluntary. You are not obligated to install it. But if you do, you only need to run Game Vindicator while you are playing your favorite multiplayer games that support it. You are welcome to close the software when you do not need it, and if you choose to do so, Game Vindicator will always un-install 100% trouble free (leaving absolutely no traces of itself on your computer). First off, you should be using shockwave 8.5....It is always recommended that when playing SFO you should use shockwave 8.5, you can download from here But make sure that you have uninstalled all the current version of shockwave you have by going to CP and then through add/remove programs remove all the shockwave versions you have before. Then clear your cache and restart your computer. After that, try going on SFO if it still freezes then press "ctrl+Alt+delete" to open windows task messegner. Go to processes find game vindicator (make sure it's open) and then increase it's priority, then it should be fine working fine. I deleted all my internet Cookies and Files restarted my pc and re-downloaded the shockwave player and its running fine. I was very mad last night but after I called down I resolved it. i use to be able to play with gv..
but now i am unable to play with it dubya tee eff?? it always says the connection to gv was lost blah blah blah..
it doesnt happen only once or twice..
and b4 anyone says this.. ive tryed to uninstall and reinstall 3 times already.. Enter a chat, fight, or story mode. In the chat/Fighting, activate it, then go to the menu, and wait. It should activate, and you should be able to use it with ease. While using the vindicator i go really smooth with it. 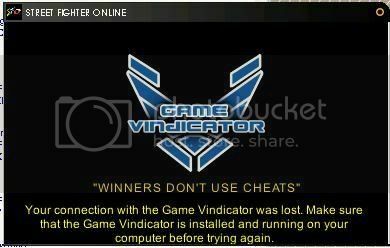 Then when i go on fighting giving rematches or even waiting for at least one more person to join my game it says "winners dont use cheats, your connection with the gamevindicator was lost make sure you have it installed and running on your computer." No special Signature...Im just Gansta Wit it. I cant play without the GV for some reason. clearing cache done that and all other things you have mentioned in this topic. I dont really know what is wrong i cant even have a hint.